The body of a grandmother whose remains were stolen by animal rights extremists has been reburied in Staffordshire. Gladys Hammond was re-interred in her original grave at St Peter's Churchyard in Yoxall following a church service for family and friends. It is just over nine years since she was originally buried on Wednesday, 28 May 1997. 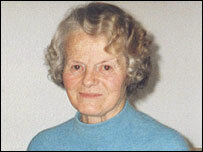 Her remains were discovered on Cannock Chase after one of four jailed activists tipped off police. A simple service of readings and prayers was conducted by the Rector of Yoxall, the Rev Jenny Lister, while the choir sang some of Mrs Hammond's favourite hymns. Her daughters, Janet Palmer and Margaret Hall, released a statement to coincide with the service. It said: "The past 18 months have been dreadful. We are extremely relieved to have been able to return our mum to her resting place at St Peter's. 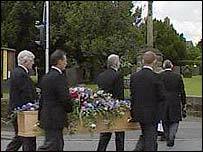 Her remains were taken from the churchyard in October 2004. They were recovered on 2 May. Mrs Hammond was related to the Hall family, targeted by animal rights protesters because they bred guinea pigs for medical research. Four people were jailed this month for conspiracy to blackmail the family, following years of intimidation of the Halls and their associates. Det Ch Insp Nick Baker, who led the investigation into the grave theft, said: "It is hard to imagine how it must feel to have to bury a loved one for a second time. "Our thoughts are with the family on this difficult day. In January the family said the guinea pig programme had closed and its certificate, allowing the breeding and supply of animals for medical research, had been returned to the Home Office.